Recreational cannabis and national pharmacare are key issues in 2019. Editor’s note: This was part of CDR’s 2019 Pharmacy Outlook in the January 7 issue. Looking ahead to 2019, the pharmacy business is poised to be more disrupted than ever before. Over the past 10 years, our members have successfully navigated a number of headwinds to their operating and regulatory environments, including price compression, regulatory changes, the introduction of caps and restrictions on commercial terms between business partners, and the reduction of professional dispensing fees. Some of these changes have undervalued patient-focused care and services, including the complexity of managing medications for an aging and complex patient population. Added to that have been more frequent product recalls and shortages, which constrain pharmacy’s contribution to Canadians’ health. Nevertheless, Canada’s pharmacy sector is holding strong. Today, we’re gaining more traction with strategies to play a greater role in the circle of care, and ensure that governments, private payers, and other stakeholders better understand that investments in pharmacy’s products and services can lead to more efficient care delivery and improved health outcomes, when and where Canadians need it. Pharmacy can become an even more integral player in the wider health care landscape. Our ability to make it happen starts with a recognition by provincial and federal governments and private payers that their publicly funded drug plans are dependent on the more than 10,500 pharmacies across Canada that make the very delivery of this vital public health service possible. 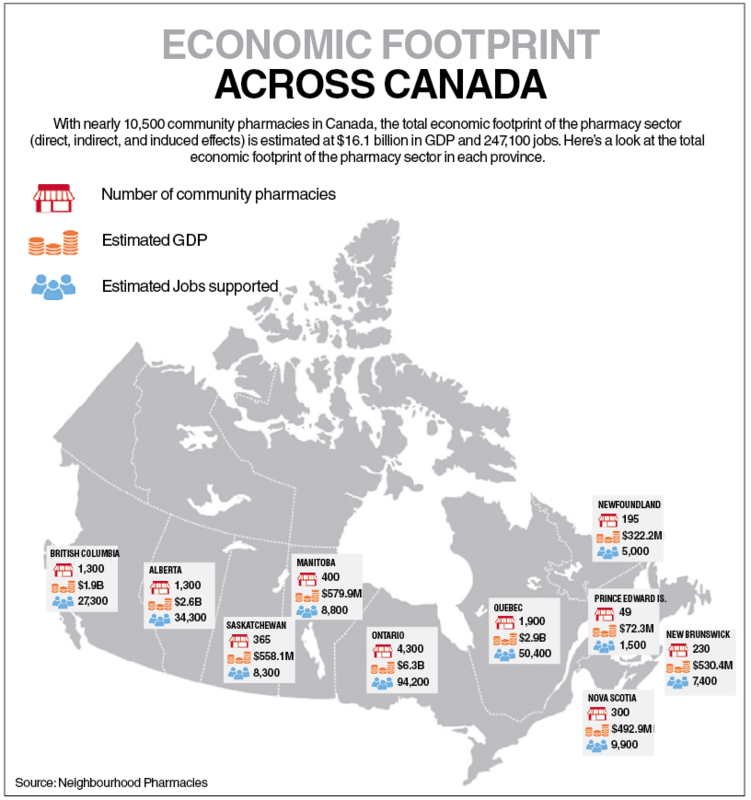 Last July, the Conference Board of Canada, with support from the Neighbourhood Pharmacy Association of Canada (Neighbourhood Pharmacies), released a landmark report called “The Pharmacist in your Neighbourhood — the Economic Footprint of Canada’s Community Pharmacy Sector.” It revealed that Canada’s pharmacies create nearly 250,000 jobs, account for $16 billion in economic activity and generate $1.7 billion in fiscal capacity, along with creating benefits to all levels of ­government. As we look towards the year ahead — and beyond — there are two major new developments with great potential to disrupt the pharmacy operating environment further: recreational cannabis and national pharmacare. Over the years, we have strongly advocated for pharmacies to be an integral channel for patients accessing medicinal cannabis, and that remains our focus. We believe that, over time, it will become clear to governments that the clinical oversight and professional expertise of our members is essential to ensuring optimal outcomes for our patients. Our members are now confronting the new dynamic created by the federal government’s legalization of cannabis for adult recreational purposes that took effect in ­October. In addition to that new challenge, the concept of a national pharmacare program will be a core tenet of the governing Liberals in the next federal election in October 2019. In early 2018, the federal government established an Advisory Council on the Implementation of National Pharmacare. Chaired by a former Ontario minister of health, the council completed its formal consultations last September. In developing the Neighbourhood Pharmacies submission, we conveyed the key insights from public opinion research: Any new plan must avoid tax increases and maintain every Canadian’s current coverage and medication options. The issue of affordability is crucial. The Parliamentary Budget Office has estimated that a first-dollar universal program would cost over $20 billion by 2021. This represents a full 1% of Canadian GDP — twice the federal government’s annual projected deficits in each of the next several years. We believe there must be five guiding principles in the development of any pan-Canadian approach: equity, timeliness of access, appropriateness of therapy, affordability and sustainability. • Cover medications for uninsured Canadians. • Introduce a program for the underinsured based on means testing. • Create more equity in formulary design through a national minimum formulary. We have also invested in gaining a clearer understanding of Canadians views, needs and engagement on national pharmacare with the launch of our Complete the Plan campaign to ensure no Canadian is left ­behind. Neighbourhood Pharmacies has taken the key leadership role of advancing pharmacy’s business interests across the broader pharmaceutical, distribution and pharmacy ecosystems to resolve the challenges confronting the pharmacy industry, from the consequences of governments’ race to the bottom on pricing to limits on reimbursement for high-cost drugs in the private insurance sector and regulatory initiatives that stifle legitimate competition, among other issues. Our members are increasing health care capacity in primary care by increasing their assessments and prescribing for common ailments, and they are becoming the preeminent location for ­vaccinations. This past year, provincial elections were held in Ontario, Quebec and New Brunswick. This coming year, there will be three more provincial elections, in Alberta, Prince Edward Island, and Newfoundland and Labrador, along with a federal election in October. It is vital that our association continues to advocate for the business of Canadian pharmacy, given the vital role our members play in creating capacity in our health care system, accessible care in our communities, and ensuring policies and regulations foster the highest quality and efficiency of care is delivered to improve the well-being of Canadians. Neighbourhood Pharmacies remains the indispensable national voice working to establish a sustainable operating environment for all our members’ specialty pharmacy models of care delivery. 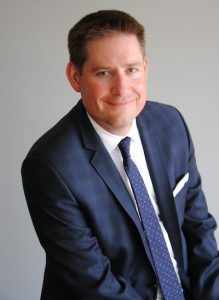 Justin Bates is the chief executive officer of the Neighbourhood Pharmacy Association of Canada.